Bell played Lt Travis Roberts on NBC Radio's Barry Craig, Confidential Investigator. From those Power and Troll Records LPs (Thrillers and Chillers, Great Ghost Stories) to the 100-plus episodes of cbsrmt in which he starred, my '70s childhood would never be the same -- or as entertaining -- without Ralph Bell! Ralph sounded very much like Edward G. Robinson. His radio performances were always enjoyable. Ralph Bell had such a distinctive voice, you could always tell it was him. I like him a lot. He sounds very similar to Ralph Bellamy (Trading Places) also. I recently heard an X-Minus One episode that starred two of my favorite CBSRMT actors...Larry Haines and Ralph Bell. Ralph Bell is my favorite of the men on the show and Larry Haines is also a favorite. They are both great actors. Ralph Bell is my favorite actor. Ralph Bell is my favorite of the men on CNSRMT! He is really a good actor! I especially love the way he plays the evil characters, lol! He is really good. Also, he was in some TV shows as well. Check out 'Suspense' episode 'The Suicide Club'. He plays the club president, who wears a patch over his eye. He was also a gifted comedian. He was in an Andy Griffith episode called 'The Cow Thief'. He was a guest on other TV shows as well. Ralph Bell is definitely one of my favorite CBSRMT actor. Agree with the praise above. Definitely my favorite actor. Such a distinctive voice which lends itself perfectly to radio. Who in the world would give him a thumbs down and why?? Ralph Bell was born on November 27, 1915 in New York City, New York, USA as Ralph Scognamiglio. 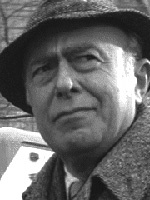 He was an actor, known for Guiding Light (1952), Zelig (1983) and Wolfen (1981). A very successful voice-over actor and announcer. He had a very quirky sing song style of delivery. Portrayed Lt. Travis Rogers on NBC Radio's "Barry Craig, Confidential Investigator He landed several roles on Broadway before turning to radio in the late 1940s, portraying characters on such shows as “This Is Nora Drake” (1947), “Yours Truly, Johnny Dollar” (1949) and “Dimension X” (1950). He appeared on many shows inluding the Patty Duke Show, The Jimmy Durante Show, The Edge of the City, Pueble, The Andy Griffith Show, later in his career, Bell acted on "Law & Order" (NBC, 1990-2010). Fans of the Andy Griffith Show know him as Special Investigator William UpChurch who came to Mayberry to help Andy and Barney solve the case of stolen cows. CBSRMT spotted in the wild. I was watching the movie Super 8 which was made in 2011, but takes place in 1979. In the opening, about 10 minutes in, there is a scene where one of the kids at his desk in his bedroom and he's listening to CBS Radio Mystery Theater. It only lasts about 10 seconds but you can hear the distinctive voice of Ralph Bell, and you could tell from the ambient sound that it was an actual episode. Could be a fun project for a die-hard fan to try to identify the episode? I struck me today I've been listening to these shows just about every day for at least 10 years now. Working through them from top to bottom and back again. They're my go-to ear candy for sitting in traffic. I'm sure there are lots of you out there that share this sentiment. One of the great voices of CBSRMT, among many greats. Somehow, no matter how far out the story, Mr. Bell could bring it to life and make it (almost) believable. Thank you, Sir! My favorite OTR actor. “Wolfen’ is a good movie.